Although the two-pound or two-sovereign gold coin in its present form goes back to 1820, there were at least two other types of coins that could be given the same title. The first of these was a double-sovereign struck during the reign of Henry VII (1485-1509) sometime after the year 1500. This coin is extremely rare and is thought to have been struck only for presentation purposes--much the same as a lot of the two-pound coins struck after 1820 were. The coin was struck using the same dies as the sovereign but the planchet was thicker. The obverse featured the king seated facing on a throne and the reverse displayed a large Tudor rose. A second coin of this type was struck a half-century later under Edward VI in 1551. These were struck the same way by using the dies of the sovereign on a heavy flan or planchet. The double-sovereign of Edward VI is also extremely rare. Like it's predecessor, the obverse depicts the king seated facing on a throne. The reverse bears a shield with a lion and unicorn for supporters. Unlike the current two-pound piece, the preceding two coins were based on a sovereign worth 30 shillings. 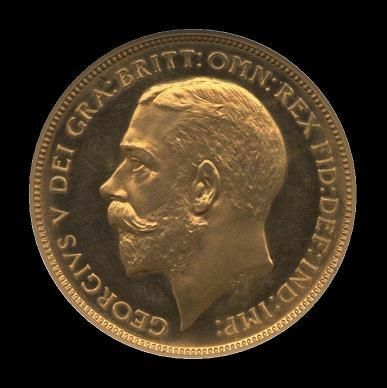 The modern sovereign is valued at only 20 shillings. The second type of coin similar to the two-pound coin is the gold two-guinea piece first struck in 1664 during the reign of Charles II (1660-1685). Like the modern sovereign the guinea of Charles II was valued at 20 shillings. The two-guinea was first struck as part of the reform that took place with the introduction of the milled coins and was struck by all subsequent monarchs until George III (1760-1820). The design consisted of the monarch's head on the obverse and usually with four shields arranged in the form of a cross on the reverse. The two-guinea coins of William III and Mary II as well as those of George II and George III have a single large crowned shield on the reverse. The coin continued to be struck until 1777 though, under George III, the denomination was struck only in 1768, 1773, and 1777 and these three are all considered to be patterns and are very rare. In 1816 gold coins became the only standard and in 1817 a new coinage was issued consisting of sovereigns and their halves valued at 20 and 10 shillings respectively. In 1820 the first 'modern' two-pound (two-sovereign or double-pound) coins were struck. Like the first double-pound, these coins were struck only in proof sets for presentation purposes and were not intended for circulation and only XXXXX were struck. Hence they are also quite rare. The obverse has the head of George III left while the reverse shows the famed St George and the Dragon type by Benedetto Pistrucci whose name is the only lettering on the reverse. 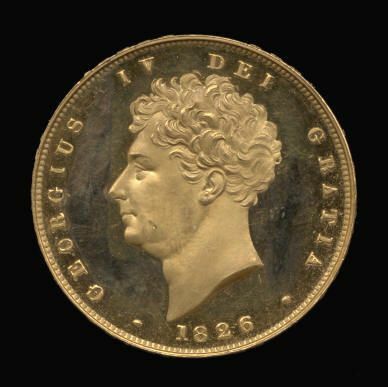 In 1823 during the reign of George IV (1820-1830) the first two-pound coin was issued for circulation. (See coin above-right) These coins were popular and can be found every so often in auctions and on fixed price lists. Expect to pay around $2000 for a specimen comparable in quality to the one depicted here, though. The reverse also shows the St George and the Dragon design. In 1826 a full proof set was issued with the new likeness of George IV and the two-pound piece (shown at above-left) was included in it. There were trial pieces of this type struck in various metals in 1824 and 1825. The reverse of this type is a crowned shield with arms. Approximately 450 of these were struck making this coin, too, quite rare. A specimen of this type may cost as much as between $8000 and $10,000. 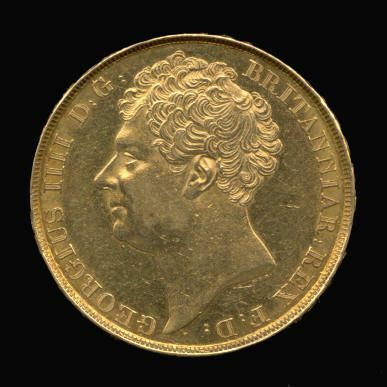 The double-pound continued to be struck during the reign of William IV (1830-1837) but again only as a proof for the coronation sets. William's two-pound coin has the customary portrait of the king on the obverse and a draped and crowned shield similar to that of George IV on the reverse. Like the previous coin, this one is also quite rare and comparably priced. 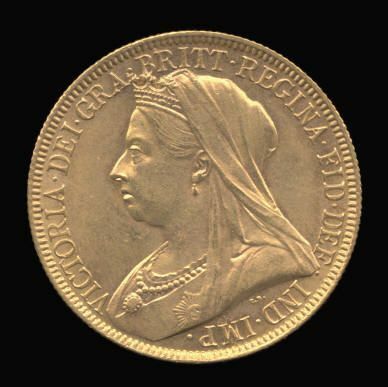 No two-pound coins were struck for the coronation of Victoria (1837-1901) and it was not until her Jubilee in 1887 and the subsequent change in the style of her portrait that a two-pound coin was again struck. Proofs were struck for the Jubilee set, but also, for the first time since 1823, a two-pound coin was struck for general circulation. The reverse of this coin is again the St George and the Dragon type. Coins were also struck with in Sydney with the 'S' mintmark. In 1902 the last double-pound coins struck for circulation were issued. These were struck alongside the matt proof specimens issued for the coronation of Edward VII (1901-1910). Like the 1887 issue, a proof was also struck in Sydney. Both the 1887 and the 1902 coins from Sydney are extremely rare. The proofs from London are struck with a matt finish (See coin left) giving them a duller look than the normal mirror proofs. The London Matt Proof had a mintage of 8,066 (compared to 45,807 for the circulation issue) The two-pound coin was included only in the long proof sets. The Matt Proof will cost upwards of $750. In 1937 there were two double-pound coins struck. The first of these was for the coronation sets of Edward VIII. 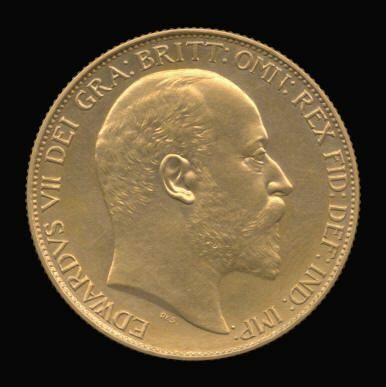 Upon the death of George V, the mint began working on the proof sets for the coronation. Edward, however, abdicated on the 10th of December 1936 and the sets were never issued. 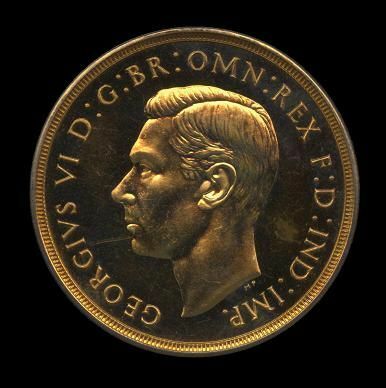 The second two-pound coin of 1937 was struck for George VI's coronation proof set and an example of that coin is shown at left. There were 5,500 mirror proofs and 1 matt proof struck. Needless to say, the matt proof example is extremely rare! The regular proofs are not common, either, though, and cost around $1000 to purchase. These two-pound coins were the last ones issued until after Decimalization. A proof set was struck in 1953 for the coronation of Elizabeth II, however they were struck only out of tradition and for the national museum collections; none of these sets were issued. After Decimalization, two-pound coins were again issued, starting with the first one in 1980 and then in 1982 and 1983. Subsequent coins were issued with the changes in portrait style that followed, and coins that were commemorative in nature were also issued which were struck in metals copper-nickel.